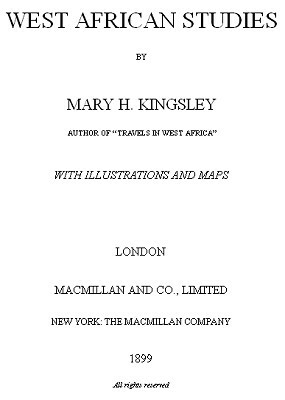 Mary K. Kingsley : Canoes and Fishing, West Africa, 1899. McMillan and Company, London, 1899. At Batanga (Cameroon), Thomas J. Hutchinson (1861) observed the local fisherman surfriding in their canoes, where the waves broke on an extensive reef. Apparently, the conditions on this day were unfavorable for serious fishing, or particularly suited to canoe surfriding, or a combination of both. Sharks are an ocasional hazard; Hutchinson was told that, shortly before he arrived, a fishman died after losing a leg to "a prowling shark."" 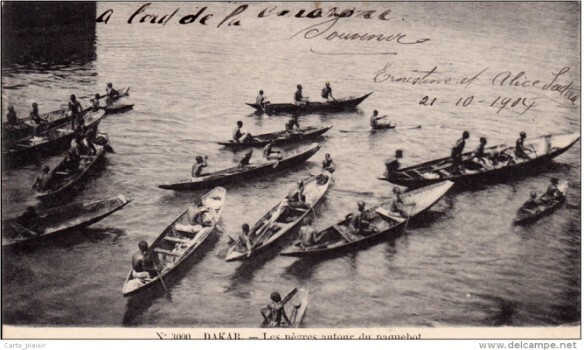 While there are eariler accounts of (adult) West Africans riding waves in canoes, in those instances they are invariably in pursuit of their livelihood, either in transporting freight or passengers, or in returning to shore with their haul of fish. In this case, the Batanga canoe riders are clearly riding the waves for simple pleasure, and in this sense, as noted by Kevin Dawson (2009), it is "the only (account from West Africa) that describes adults surfing (recreationally)." 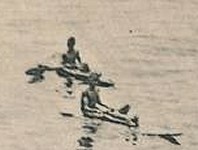 In the second of two books of her travels to West Africa, a photograph by Mary H. Kingsley (1899) shows six Batanga men and their canoes, possibly identical to those observed surfriding by Hutchinson forty years earlier. "The fishing chapter was also cast out of Travels in West Africa. Critics whom I respect said it was wrong of me not to have explained how I came by my fishes. This made me fear that they thought I had stolen them, so I published the article promptly in the National Review, and, by the kindness of its editor, Mr. Maxse, I reprint it. It is the only reprint in this book." He has only got himself to blame. Let him try and introduce the Polynesian practice of swimming about in the surf, without his clothes, and with a suitable large, sharp knife, slaying sharks—there’s no end of sharks on the Gold Coast, and no end of surf. The Rivermen have the same complaint, and I may recommend that they should try spearing sting-rays, things that run sometimes to six feet across the wings, and every inch of them wicked, particularly the tail. There is quite enough danger in either sport to satisfy a Sir Samuel Baker; for myself, being a nervous, quiet, rational individual, a large cat-fish in a small canoe supplies sufficient excitement. The native fishing-craft is the dug-out canoe in its various local forms. The Accra canoe is a very safe and firm canoe for work of any sort except heavy cargo, and it is particularly good for surf; it is, however, slower than many other kinds. The canoe that you can get the greatest pace out of is undoubtedly the Adooma, which is narrow and flat-bottomed, and simply flies over the water. The paddles used vary also with locality, and their form is a mere matter of local fashion, for they all do their work well. 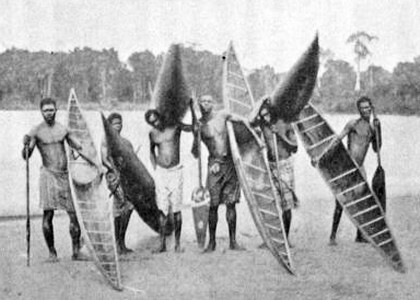 There is the leaf-shaped Kru paddle, the trident-shaped Accra, the long-lozenged Niger, and the long-handled, small-headed Igalwa paddle; and with each of these forms the native, to the manner born, will send his canoe flying along with that unbroken sweep I consider the most luxurious and perfect form of motion on earth. The mat sails used for sea-work are spread by a bamboo sprit. There is a single mast, to the head of which the sail is either hoisted by means of a small line run through the mast, or, more frequently, made fast with a seizing. Such a sail is worked by means of a sheet and a brace on the sprit, usually by one man, whose companion steers by a paddle over the stern; sometimes, however, one man performs both duties. Now and again you will find the luff of the sail bowlined out with another stick. This is most common round Sierra Leone. Postcard: Les Negres Autour du Paquebot. (The Negroes Around the Ship), Dakar, Senegal, 1904. 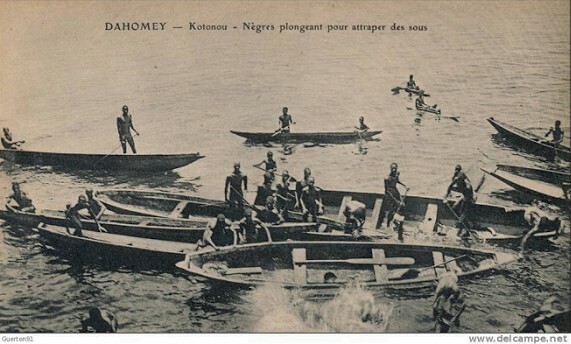 (Kotonou, Africa, Dahomey, Negroes plunging to catch on), c1914. Geoff Cater (2013) : Mary H. Kingsley : Canoes and Fishing, West Africa, 1899.